This amazing picture comes to us courtesy of the Wall Street Journal's Chris Herring. 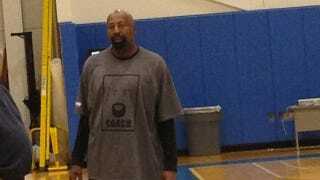 That's Knicks head coach Mike Woodson wearing a shirt that bears his own stoic visage above the word "Coach." It's so simple yet so hilarious, and it's the best wardrobe decision that any NBA coach has ever made. It's been fun to watch Woodson become a more notable NBA personality this year. Nobody ever paid any attention to him in Atlanta, where he was a straight man coaching a team full of boring straight men, but in New York he has become the perfect comedic foil to this madcap Knicks team. I mean, we're still laughing at this picture.